Whoops: GPS locator switches on, sparks search - what happened? Lost Prineville hunter avoids hypothermia in Ochoco mountains! What did he do right? Fallen solo climber on Mount Thielsen, rescued by "chance encounter"
Climbing party "saved" by big warm dog and cell phone on the ski slopes of Mt. Hood! Mount Hood - What happened to the three North Face climbers in December 2006? American Alpine Club's "Trad Award" for "mentoring" goes to Robert Speik! The classic Snow Creek Route, a 10,000 foot gain! An overnight cross country circumnavigation of South Sister! 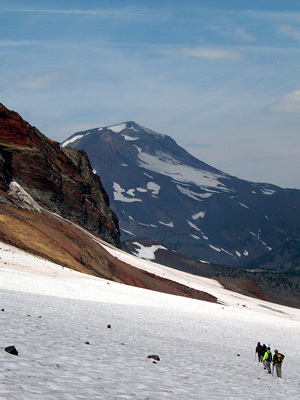 A cross country circumnavigation of Broken Top across the Bend Glacier! X-Adventure Raid Adventure Race North America qualifier in Bend! Mountain Link Senior Guide JJ Justman's Mt. Everest summit! New topo maps of Nordic and snowshoe trails - printable with UTMs! Together with Bend's nice weather! no popups, no advertising, ever! Free - Rappelling from basic to advanced! Free - Winter camping from bivy to base camp! Free - Steep snow climbing and ice axe arrest seminars! Mt. Whitney's east face route is quickest! How can I prevent, recognize and treat hypothermia in the backcountry? What is the best new GPS for backcountry and mountaineering? What do you carry in your summer day pack? Plus photos of this gear! Which topographic maps really work with your compass and GPS? How do you use your $7 topo map, $30 adjusted compass and $100 Garmin GPS together? What is a good "digital" cell phone for mountaineering and backcountry travel? Why is an "emergency kit" dangerous? How can I self belay my rappels? What do you know about Tick Talk? What are the best snowshoes? Best crampons? What about digging and designing a safe snow cave? What about novices climbing Mt. Hood? What's in the best summer backpack for Mt. Adams? Plus photos! What is the best inexpensive base plate compass, topo map and new GPS? What is the best traditional mountaineering ice axe? Black Diamond Raven Mountaineering Ice Axes to 90cm, $60.00! Suunto M3D Leader Compass with adjustable magnetic declination, $25.00! Garmin eTrex Venture HC, new $100.00! Reviews and a BIBLIOGRAPHY, as well! My personal 1972 Chouinard Catalog of clean new hexentrics, pitons, harnesses! and more! More than 389 selected and indexed external links you will like! all illustrated through photographs and accounts of actual shared mountaineering adventures." Dialup download times for these web pages are held to a minimum! Blazing 100 megabit broadband experience too! for limited nonprofit educational use by schools and clubs. Original material Copyright© 1995-2019 by Robert Speik. All Rights Reserved. Total unique viewers world-wide maximum seven days: 310,168; server requests (hits) during maximum seven days: 2,171,179! Viewed maximum seven days from 31,174 hosts in >50 countries around the world with 28.23 gigabytes of data transferred! This web has about 355,877 files, 14,593 images, 166,485 hyperlinks including 11,535 external links! Listed first web page in the world by Google's Search on "traditional alpine mountaineering", "map, compass and gps together", "light and fast climbing", "Yuppie 911 Devices" and many more! Consistently listed in the top 40 percent of all websites, world wide! Wikipedia, The Source, Bend Weekly, Sisters Nugget News, The High Desert Pulse, The (Seattle) Mountaineer, The Cascades Mountaineer, CascadeClimbers, Huel Hauser, NBC, ABC, KPOV and more! Honored with the 2006 Oregon Section American Alpine Club's "Trad Award" for mentoring mountaineers and climbers! Contributor to "Accidents in North American Mountaineering" for 18 years - 1998 to 2016! Special Mention in ANAM in 2014, 2015 and 2016! Pacific Power Blue Sky Wind Energy powers this Website!